[Portable Makeup Mirror for Travel] With the folding size of 12x15.5cm, You could put it in your purse and keep it in there or even just keep it in your make up bag for when you need to get ready for the day, could be going with you on every trip. [Tri-fold Make up Mirror] The mirror has three sides so you could see from all different angels on how your make up or even how your hair looks. [CR2032 button powered] The light is powered by two CR2032 button cell batteries.Please change the battery if you can\'t turn it on after some days\' using. Normally new batteries could be used for about 2-3months. 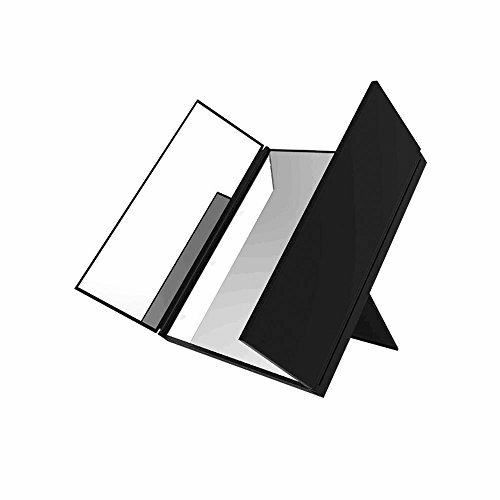 [Stand Mirror] The mirror could be adjusted to 90 degrees,it\'s totally adjustable and steady with back stand holder. Great product, smaller than expected. A little large for a regular handbag.